The Historic Landmarks Commission will consider future plans for the Cabrillo Boulevard and Highway 101 intersection near Coast Village Road, including a right-hand turn lane onto the freeway and widening the Union Pacific Railroad bridge. Both improvement projects are designed to enhance pedestrian and cyclist safety and access to surrounding areas: connecting downtown to the waterfront and Funk Zone in the case of the State Street project, and connecting Cabrillo Boulevard with Coast Village Road and Montecito for the other project. .At Tuesday's Santa Barbara City Council meeting, members will consider passing a resolution to add the project — widening State Street sidewalks and installing buffered bike lanes under Highway 101 — to the city's Capital Improvement Program, and telling city staff to apply for funding grants and work with Caltrans for project approval. Since the undercrossing was built in 1991, with five vehicle lanes and 5-foot sidewalks on each side, "pedestrian volumes through the undercrossing have grown exponentially while traffic volumes have remained constant," according to a staff report prepared by Rob Dayton, city transportation planning and parking manager. The report claims the sidewalks are a barrier to pedestrians traveling between downtown and the waterfront area. "Additionally, the excessive number of vehicle lanes and road slope have promoted higher vehicle speeds, which have resulted in a number of collision injuries, the majority of which are bicyclists," the report says. "The undercrossing is an unattractive environment for pedestrians due to vehicle noise and the darkness of the location, even during the day." The city could widen the sidewalks and add buffered bike lanes if the five-lane roadway was reduced to three lanes, according to the staff report. Santa Barbara’s Transportation and Circulation Committee discussed the item in February and recommended the City Council adopt the resolution. Underpass improvements could include public art, and the city has held public meetings asking for ideas to make the underpass more inviting. The city would apply for grant funding for the proposed sidewalk widening and bike lane project, which is estimated to cost $5 million to $5.5 million. The Santa Barbara City Council meets at 2 p.m. Tuesday at City Hall, at 735 Anacapa St.
On Wednesday, Santa Barbara's Historic Landmarks Commission will consider the future of the 1700 block of East Cabrillo Boulevard, at its intersection with Highway 101 near the Andrée Clark Bird Refuge. The proposed project, from the city and Santa Barbara County Association of Governments, includes replacing the Union Pacific Railroad bridge, widening the roadway's bike lanes, installing new sidewalks, and adding a right-turn lane onto northbound Cabrillo Boulevard for a proposed southbound Highway 101 on-ramp. 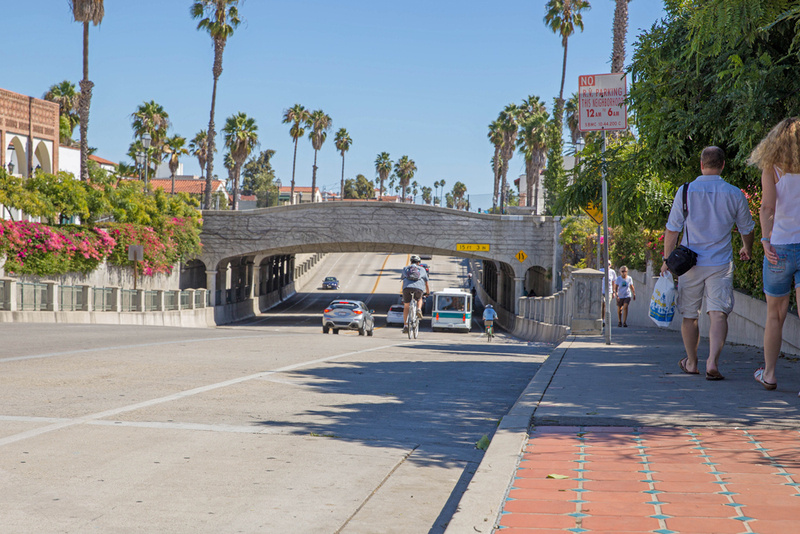 The plan aims to create a safer corridor along East Cabrillo Boulevard for pedestrians and bicyclists and improving access between the coastal zones to the commercial areas along Los Patos Way and Coast Village Road, according to the project description. It also aims to reduce traffic congestion and improve mobility with the proposed construction of a roundabout at the East Cabrillo Boulevard and Los Patos Way intersection, according to a staff report. SBCAG's Highway 101 widening project has drawn critics worried about traffic impacts to Santa Barbara and Montecito-area intersections, and there are parallel projects that aim to improve some of those intersections, including the East Cabrillo Boulevard area, Olive Mill and Coast Village roads, and San Ysidro Road at Highway 101. The proposed East Cabrillo Boulevard project requires an environmental impact report and extensive design review, including Historic Landmarks Commission approval, a Coastal Development Permit by Santa Barbara’s Planning Commission, and the city’s Parks and Recreation Commission review. It also has a Historic Resources Evaluation Report, which concluded since the East Cabrillo Boulevard Historic District is eligible to be designated a city landmark, and that the project would not have an adverse impact to the historic resource, according to the meeting agenda. The Historic Landmarks Commission will meet at 1:30 p.m. Wednesday in the David Gebhart Public Meeting Room, 630 Garden Street in Santa Barbara. The HLC previously reviewed the project in January.